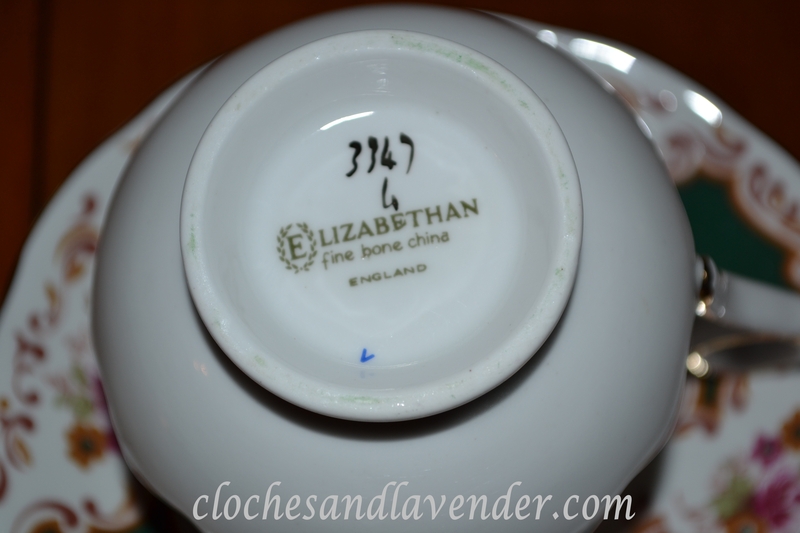 This tea cup is another very special cup because my Great Uncle bought this for my mother on one of his business trips to England many years ago. This was my mothers favorite out of all of the cups she owned. She loved the boldness of the colors and she really like the pattern. Not to mention it was from her favorite uncle. I’m happy that she left me so many wonderful cups that I can share with you now and then. I am sorry but I don’t see any teacup picture ..
Got it! It is very pretty. Haven’t seen this one before. It is majestic. Most of all, I love the story behind it. It is wonderful that you have her cups and know their stories. Love the green in the pattern! It is a unique pattern. Very pretty. What a pretty teacup pattern. No wonder you love it as well. 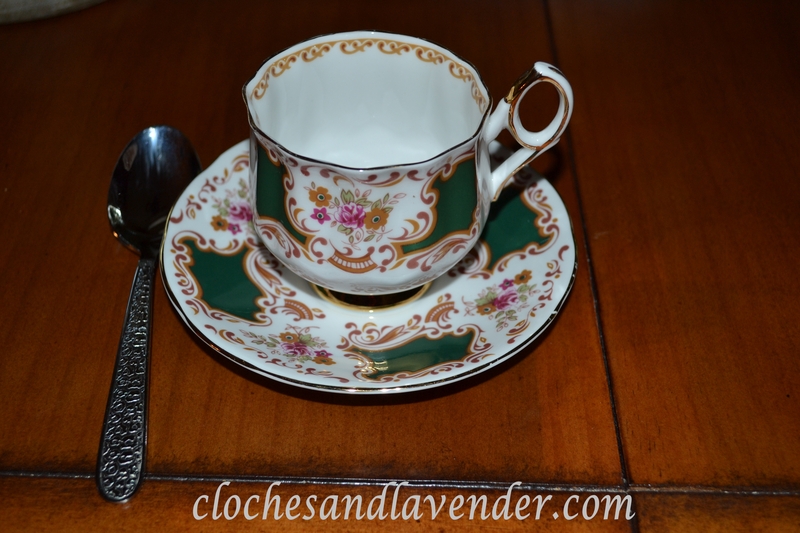 Thanks for sharing and linking to Tuesday Cuppa Tea! Beautiful, I have never seen that one before. Thanks. 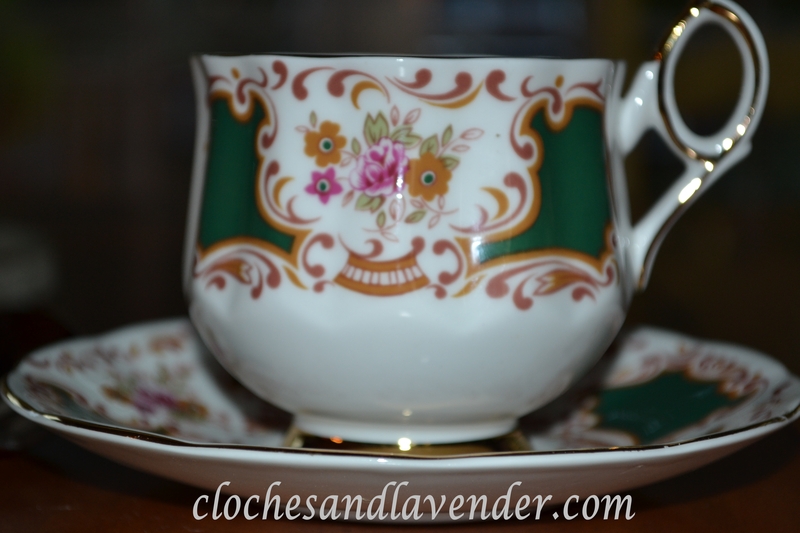 Love the shape of this cup – I have a similar one…. same shape but different pattern. Thanks for sharing this treasure. A nice pattern with a unique handle. This one means a lot to me since it was her favorite! What a gorgeous teacup! I can understand why it was your mother’s favourite! I love the rich green and the shape of it. Very lovely! Thank you for sharing your little treasure with us and joining me for tea. Have a lovely week. What a beautiful tea cup. I can see why it was your Mother’s favorite. 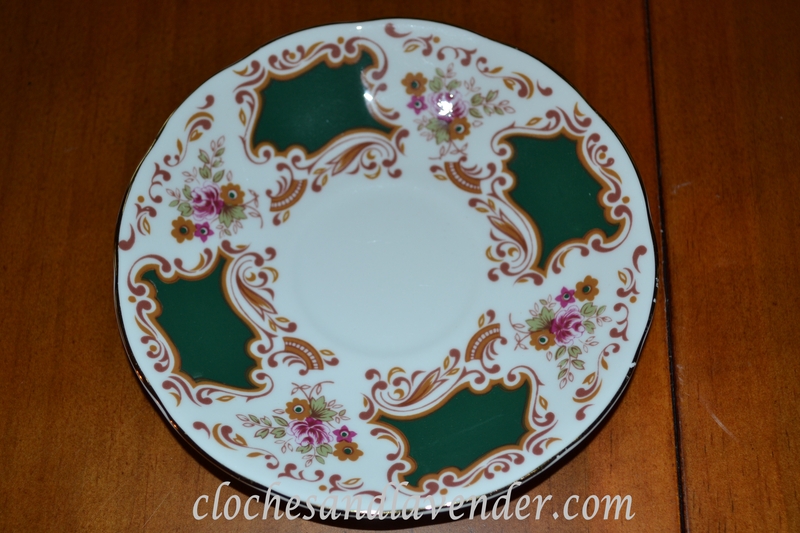 Hope you’ll share it at Frugal Treasures Tuesday! Have a great week. This a very classic design! Hello again, Just wanted to mention that Lady B and I are having a tea-themed giveaway you may be interested in. Come on over and visit.